Contact pages, contrary to the belief of many website owners, are much more than a means of communication with the website visitors. As per the top IT consultants, contact pages play a significant role in a business’ online presence as they inspire people to reach out. Great contact forms generate new business opportunities, help prospective customers to contact without any hassles, attract talented workers, show a way for new partnerships, and last but most importantly, improve customer experience. 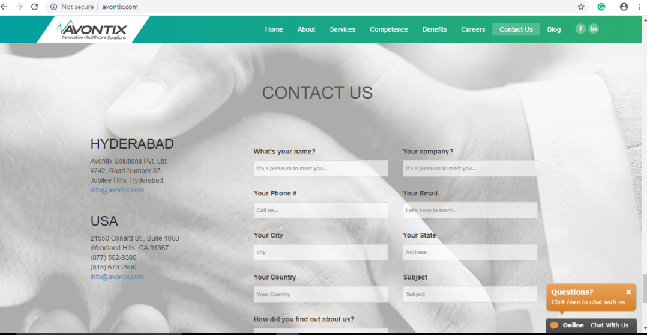 So, it should be understood as to how contact forms can be made effective and what the best practices are in designing a great contact page. Easy to locate: One of the prominent features of a great contact page is that it can be easily located by the users of the website. IT consulting firms say that a link to the contact page in the header or footer section can be easily located by the website visitors. Also, it is essential that the contact form is named appropriately with terms such as ‘support’, ‘help’, and ‘contact us’ so that the visitors can identify that it is a contact page through its name. Give a human touch: Customers and prospective customers are often turned off with the thought of communicating mechanically through texts or emails without being aware of the person with whom they are communicating. That’s the reason many experts from IT consulting firms suggest humanizing a customer support team with photos and names of the support staff. Giving the assurance to the customers that real human support is available to them, makes them confident that help is on the way. Adaptability: Every human being is unique and thinks uniquely. So, there is nothing like a perfect design for a contact page. Website owners should be able to take IT support and adapt to the different needs and situations of the customers and make some changes to their contact form design if needed. Centralizing is good: Website owners should centralize all of their contact options such as email, tech support, phone numbers, and physical address in one location as this is of great help to customers who are not able to reach you through any one medium due to any reason. Even if the customers are not able to contact on your phone numbers, they can drop an email. Guide the customers: IT consulting firms recommend guiding the customers to a proper channel of contact through the contact page design as it is really effective in resolving queries in a much easier and quicker way. The design should guide the customers depending if they need to check the FAQs section or drop a mail or contact a live support person. Response expectation time: One of the best ways to make a contact page effective is by providing the expected time taken in getting back to the customer. This gives the required assurance and confidence to the customer that their query would be resolved within a specified time. An effective contact page definitely adds value to a website by delivering both the desired functionality and a great user experience. Simple design, right length, and perfect balance between creativity and usability are certain key features that help a contact page work effectively. To create the best contact page for your website, hire the best IT support professionals at Accuprosys.